As a result of my fact-checking, The Atlantic has published yet another correction and update to an error-riddled March 11 article, The Grand Vision of Dr. Heimlich, After the Maneuver Limelight by reporter Lindsay Abrams. My March 26 item, Gettin' jiggy with reporter Lindsay Abrams's Atlantic article about my father, chronicled my first round of prying out corrections from the magazine. I then submitted this corrections request to Atlantic editor James Bennet. 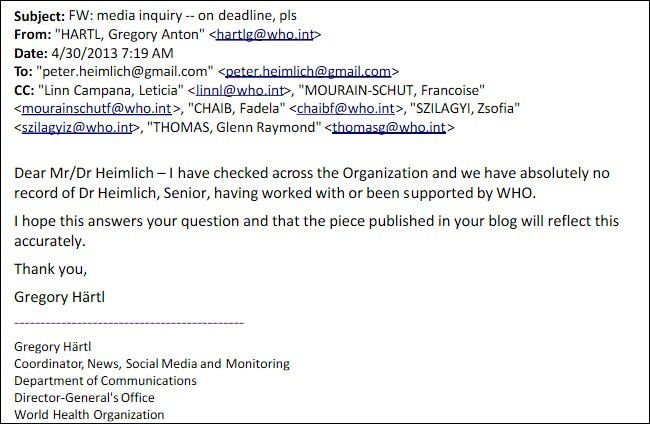 Call me a stickler, but shouldn't that read, "According to an e-mail sent to Peter Heimlich by the WHO Director-General's office"?